There’s nothing quite like the feeling of spring. New life emerging and a warmth in the air after a long, cold winter. Spring cleans are a fabulous way to inject a new lease of life into your home and prepare it for the season ahead. Historically originating when homes were heated solely by fireplaces, spring cleaning signalled the coming of warmer temperatures and this was the season to air the house and rid it of soot, dust and dirt which had accumulated over the winter months. Nowadays it’s not quite as necessary, but it’s a ritual that we anticipate to refresh and reboot our homes after a season of central heating and staying cosy indoors. But how many of us are easily able to spend hours and hours toiling over essential housework duties, especially when tackling a large, deep clean? Whilst a necessary job, it’s one that most of us simply don’t have the time to undertake. That is, unless you have the right equipment and methods. As a nation of proud home owners, our home is our castle. A cleaning survey reports that 47% of us spend up to five hours a week cleaning our abodes*, signalling just how important cleaning and tidying is for us. To help breathe a new lease of life into your home, high street retailer Robert Dyas have put together some handy hints and tips to help you battle the grime and cut the clutter. So, when you don’t have hours to spend on a thorough tidy up, don’t let the dust defeat you. After all, cleanliness is next to Godliness. The use of technology within household items puts a new spin on housework, to make your chores both easier and more fun. Cleaning Brush (Was £39.99 now £24.99). With a long extension arm, you can handle all those hard-to-reach areas, whether it’s a high ceiling, shower head, car roof or stair banisters, it’s perfect for any hard-to-reach nooks and crannies. For spring-cleaning cyber-style, why not try a robotic cleaning system? They are the ideal solution for when time really is of the essence, but you need to get the job done quickly and efficiently. Save time (and your back!) by putting a robovac to work, whilst keeping control of its movements. A fantastic partner to help with the housework, giving you more time to do other jobs or simply put your feet up and watch the results. 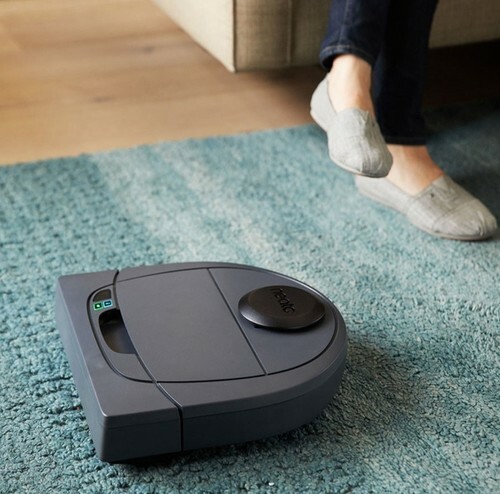 Make light work of mess with the all-singing, all-dancing Neato Botvac Connected D3 LaserSmart Navigating Wi-Fi Robot Vacuum Cleaner (£449.99). Featuring WiFi, laser navigation and most importantly, powerful suction, to ensure all grub and grime is erased from carpets and hard floors. For a lighter but no less effective clean, why not try the Vax TBTTV1F1 SlimVac Fur & Fluff Cordless Vacuum Cleaner (Was £199.99 now £99.99)? Perfect for everyday use, it’s a great addition to households that like to keep on top of their hoovering, without the hard work. For cleaning, sanitising and drying, a steam cleaner is guaranteed to help ease the workload in any home. Using very little water but providing powerful results, steam cleaning is a quick and easy process to help you banish germs and remove stubborn stains from household surfaces. For an all-in-one system that can take on hard floors, carpets, soft furnishings, tiles and even glass, the Morphy Richards 9-in-1 Steam Cleaner (£49.99) is your new best friend. With an impressive 400ml water capacity and a detachable hand-held device, you’ll be able to reach all of those nooks and crannies, without any bother. Nine fuss-free features all captured in one device. What could be simpler? Now it’s time to move to one of the most used rooms in the house – the kitchen. Given the nature of its job, your kitchen will inevitably suffer from mess and food stains. But no need to fear the filth. With these powerful products, your work surfaces and white goods will be sparkling like new in no time. For solutions that cover all areas, why not try the HG Range to cover all aspects of maintaining your sacred space to its best appearance. The HG Ceramic Hob Thorough Clean (£4.29) both cleans and gives a protective gloss to your ceramic surfaces. Given it’s where you keep a majority of your family foodstuffs, keeping fridges clean is of huge importance. With the HG Hygienic Fridge Cleaner 500ml (£3.19) make a would-be messy job, more simple. Don’t forget to look down. The HG Super Remover (£10.49) will guarantee spotless floor tiles, flagstones and stone floors. For eco-warriors, there’s no need to compromise on results. The E-Cloth Classic Boxed Mop (£12.49) boasts an impressive 1-1.5 metre handle for hard-to-reach areas. Using only water, the mop helps to break up bacteria, grease and grime without the need for nasty chemicals. And finally, for a blissful bathroom you need to add some sparkle back into your sanitaryware. Keep your porcelain pristine with the HG Bath Shine (£4.59) to guarantee a clean and shiny finish on baths and basins. Keep grubby grout at bay with the Harpic Fresh Power Summer Breeze Rim Block (£2.49). Add some HG Professional Limescale Remover 500ml (£5.49) and you’re guaranteed a gleaming shower area all round. Keep your loo looking lovely with these Jeyes Bloo Powercore Toilet Cistern Block (£1.99). Clean cisterns to the core and keep smells fresh. For a cleaner that gets to grips with anything you throw at it, this Method All Purpose Cleaner – Water Mint (£2.99) provides a simple solution with impressive results. The delicate water mint fragrance adds a perfect finishing touch. This press release was distributed by ResponseSource Press Release Wire on behalf of Robert Dyas in the following categories: Children & Teenagers, Men's Interest, Entertainment & Arts, Leisure & Hobbies, Home & Garden, Women's Interest & Beauty, Consumer Technology, Media & Marketing, Retail & Fashion, for more information visit https://pressreleasewire.responsesource.com/about.